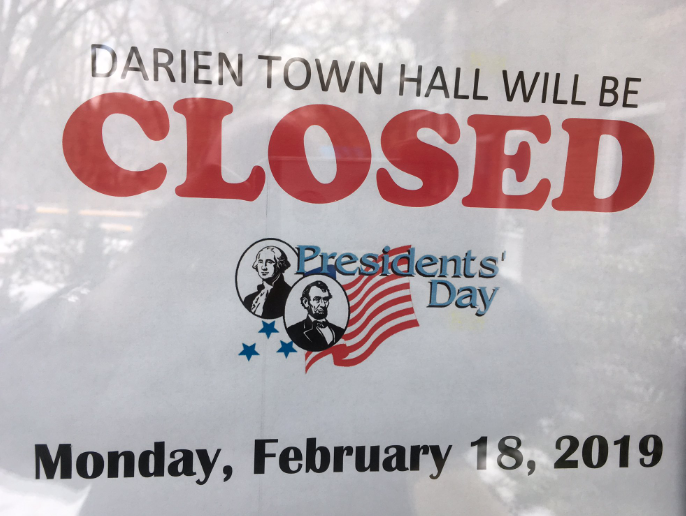 Here’s what’s open and closed in and around Darien for Washington’s Birthday (unofficially, “Presidents Day”), Monday, Feb. 18, 2019, celebrated on the third Monday of February. —Metro-North — “On President’s Day, Monday, February 18, Metro-North Railroad will operate on a Saturday schedule,” the railroad said in an announcement. —Darien Library, open regular hours for a Monday — 9 a.m. to 9 p.m.
—Darien Community Association, YWCA Darien/Norwalk, Darien Nature Center appear to be open for regular hours (there are no announcements about the DCA closing, and we don’t see a list of holidays on the websites). —The Maritime Aquarium in Norwalk is open during regular hours. —Stepping Stones Museum for Children in Norwalk is open. —The Bruce Museum in Greenwich is open. The sign on the Darien Town Hall front door. —Darien Public Schools are closed all week. Classes resume Monday, Feb. 25. —Town Hall and town administrative offices are closed. —Darien Recycling Center, also known as the Transfer Station and the Dump — open for normal hours, 7 a.m. to 2:45 p.m.